What a run! John and I headed out to Jester Park for an 8 mile trail run. the 8+ miles took about an hour and 20 minutes - I think it was like a 9:30 pace, but it was exactly what I needed. I have never really felt like John and I get into a good running rhythm at Jester Park. The trails don't seem to flow together, we usually need to stop and turn around; or figure out which area to run again. However, today was different. It was a great 8 mile loop that flowed well. We ran through hills, along the lake (or river? I think it is a lake??) and today the loop worked out well. My shin is getting better - I have ran twice now over two weeks. I'm going to still take it easy though - no need to push the recovery as I don't have a race planned at this point for the late fall or winter. But the trails just felt right. 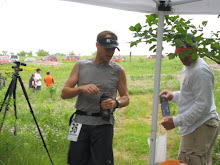 Maybe I'll skip a marathon this fall and try another trail race before the year's end? ?